... at our small, affectionately managed hotel in Karlsruhe. Our hotel is provided in the part of town named Hagsfeld, with good link up to the public transport and a short way of a few minutes to the town centre. 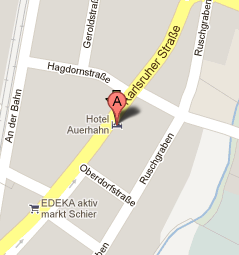 By coming up the highway A5 you achieve our hotel, by leaving the highway at Karlsruhe-North it takes 5 minutes by car. It would be a pleasure to welcome you as a guest in our house. We would like to spoil you with cultivated hospitality and our fine kitchen. Our rooms are completely renovated and with modern equipped. In our little comfortable restaurant you can enjoy lusciousnesses of the german and national kitchen with well selected and fresh ingredients. We are looking forward to your habitation at our hotel!